When I was a kid, my favourite soup was chicken noodle. Preferably from a can. And preferably without any chicken and mostly noodles. I would often eat canned soup for lunch on the weekends. It was easy enough for me to make myself once I knew how to use a can opener and the microwave (that’s right, I didn’t even cook it in a pot on the stove). Chicken noodle soup was my thang. For years. Even as an adult, it was one of my favourite things to eat when I was too lazy to come up with something a bit more creative. Now, though, I’m obviously done with chicken noodle, but I still love the comfort of soup. 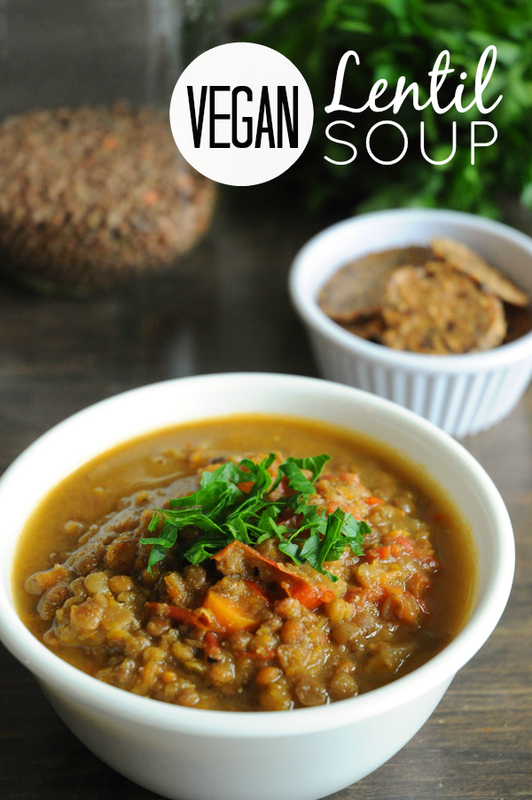 My current favourite is vegetable, but this lentil soup is a close second. It’s easy to throw together, it’s crazy good for you, and it tastes amazing. Way better than chicken noodle soup ever did. Side note: Photographing soup is HARD. Photographing brown soup is even harder. Perhaps the green parsley on top will help? What if I stick some green in the background? Be jealous of my food photography skillzzzz. Or not. When it’s cold and gray outside (like today at my house! ), soup is the perfect remedy. 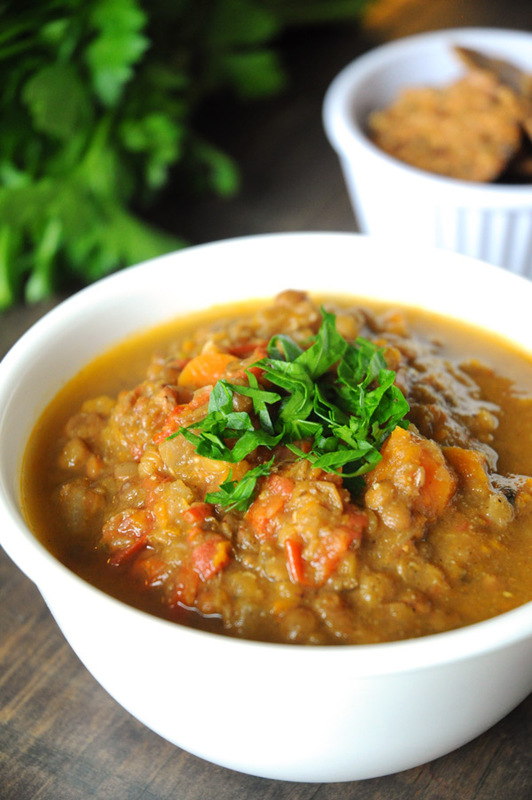 Try this lentil soup and let me know if you enjoyed it as much as I did! Add in the onion, carrots, celery and garlic, and cook until tender and browned. Add the lentils, cumin, coriander, broth, bay leaf and fresh thyme. 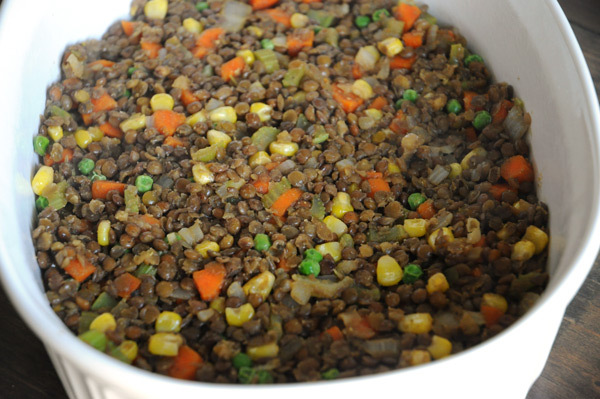 Give it all a good mix, then add lid and simmer over low heat until the lentils are tender, 30-40 minutes. Remove the bay leaf and thyme, and add in the chopped spinach and tomatoes. Cook for 3-4 minutes, or until spinach has wilted. season with salt and pepper, and serve, with some fresh parsley on top for colour (if desired). Just look at these beauties. So gorgeous, so tasty, so healthy, so amazing. I’m in love! 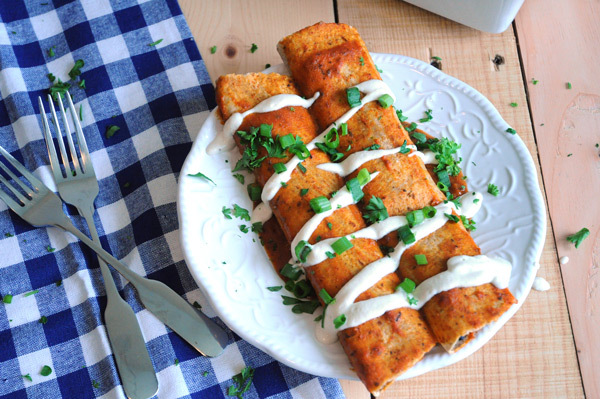 This recipe all started with an expired jar of enchilada sauce. You see, I had planned on making some enchiladas for dinner recently, and so I went to the store to buy some enchilada sauce. Because, you know, I was too lazy to make my own. I came home, ready to get down to business, and that’s when I noticed that the enchilada sauce that I JUST BOUGHT was expired. By 3 months! That’s what I get for trying to go the easy route. After a fit of rage ensued (not really, but kinda sorta yes it’s true), I took some deep breaths and decided to just make my regular enchilada sauce. I had all the ingredients, and it was easy, so fine. I’ll do it. I wanted enchiladas too bad to give up on the whole operation. 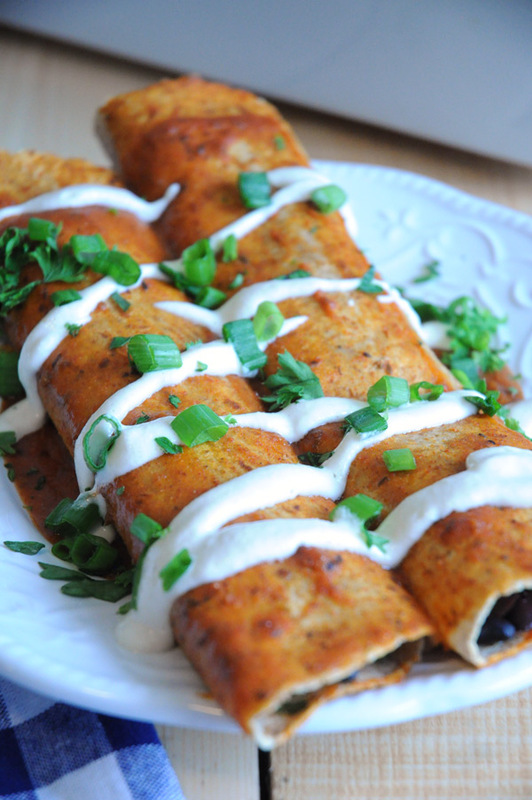 After THAT situation was handled, I got to work on the filling for these enchiladas. I just used a few veggies I had in my fridge. When they were done cooking, I then drizzled some super yum cashew cream on top, sprinkled pretty things on top (because I like pretty food), and stuffed my face. Totally oblivious to the awful enchilada sauce experience I’d just had. Because DAMN, these things are GOOD. In a small pot, heat your oil until warm, over low heat, then add in the flour and whisk until there are no clumps remaining. At that point, you can add in your spices, tomato paste and vegetable broth. Whisk until smooth. Simmer for about 10 minutes, or until thickened. Add all ingredients to a food processor or high-powered blender and process/blend until very smooth. Add your oil to a large pan, over medium heat. Once warmed, add in your diced onion, and cook until softened, about 5 minutes. Then, add in the bell pepper and zucchini. Cook for another 5 minutes, or until softened. Add in your cooked black beans and corn, until it's all warmed through. Season with salt and pepper. Remove the pan from heat and set aside. Preheat your oven to 350F and add a big ladle-full of enchilada sauce to the bottom of a 9x13 baking dish. Add about 2 tablespoons of veggies to a tortilla, top with olives, green onion and cilantro/parsley. Roll it up tightly, and place seam-side down in your baking dish. Repeat with remaining tortillas. 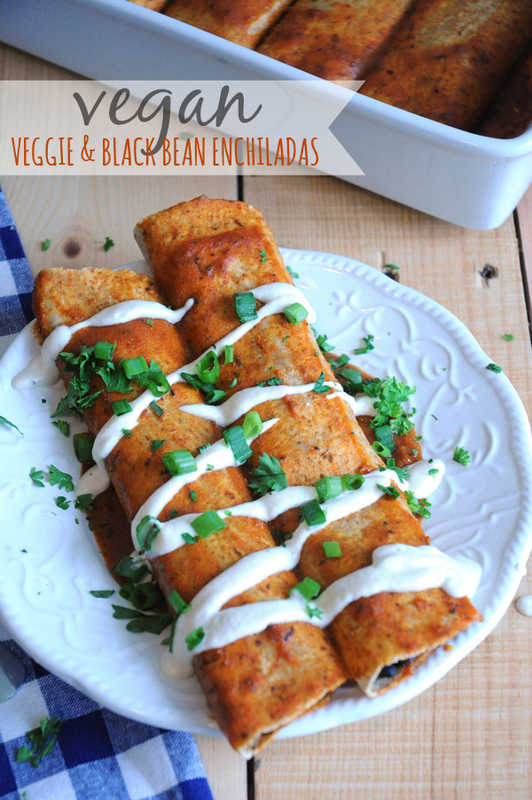 Pour the enchilada sauce over your enchiladas, making sure to cover everything well. Cover the baking dish with foil, and bake for 15-20 minutes, or until the sauce is bubbling around the edges. Serve with a drizzle of cashew cream, chopped cilantro/parsley, and a few more green onions on top. Okay FINE. It’s fall. I get it. I’m accepting the cold weather that won’t seem to go away. I’m accepting that soon enough, my kitchen will be bursting at the seems with all things pumpkin (no complaints there!). I’m accepting that OMG CHRISTMAS IS COMING. I suppose I should get going on my shopping then, huh? But first – chili. Smoky barbecue chili. To help ease my pain of no more summer. This is such a fun change from the regular chili that I make. I love adding Sweet Baby Ray’s barbecue sauce, because I find it has a sweet, smoky flavour that is really delicious in chili. I also added smoked paprika because, why not? Smoky goodness up in huuuurrrrr. You don’t have to feel bad eating this chili either. It’s loaded with veggies, veggies, and more veggies. 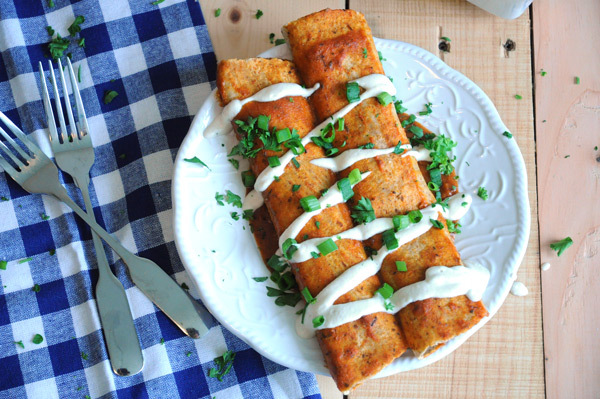 And with a silky white drizzle of delicious, homemade vegan sour cream added on top? Hot damn! This is a tasty meal. A tasty, healthy meal that I ate two bowls of last week. In a row. I am not ashamed! Heat oil in a large pot over medium heat. Add in the pepper and onion and cook until onion becomes translucent (about 5 minutes). Add in the garlic and good for another minute or so, or until lightly browned. Add in the diced tomatoes, vegetable broth, chili powder, cumin, smoked paprika, red pepper flakes and mix well. Add in the beans, frozen corn, and barbecue sauce, and mix again. If it looks too thick, add in some more vegetable broth, just a bit at a time. Remember that it will thicken as it cooks, so you don't want it to be too thick right off the bat. Cook for about 20-30 minutes. About 15 minutes before the chili is done cooking, add in your chopped greens, salt and pepper. Adjust s&p as necessary. 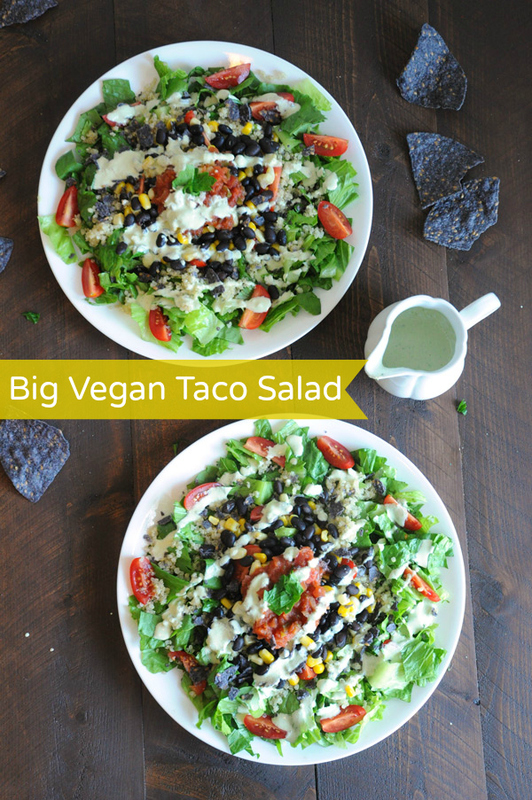 Serve, topped with vegan sour cream, chopped green onions, or whatever else you like on your chili! Add all ingredients to a food processor or high powdered blender and process/blend until smooth. Will keep in the fridge up to 5 days. Fall is in the air. Can you smell it? Though it’s not technically fall yet, I have already started making fall foods, because fall foods are the BEST EVER EVER. 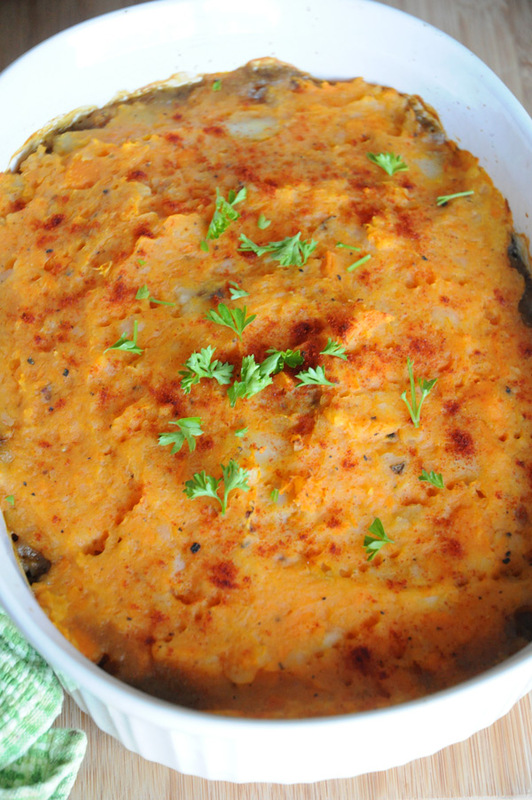 Like this sweet potato shepherd’s pie. 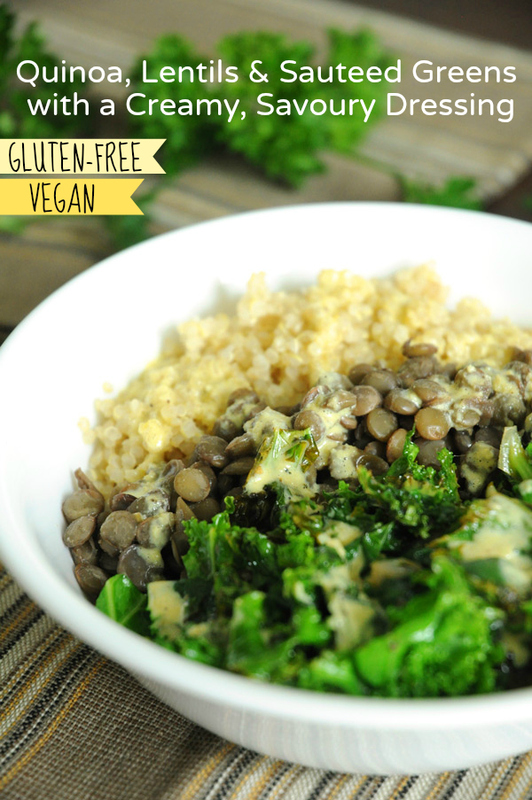 Gluten-free and loaded with good stuff like lentils, peas, carrots and corn. Perfect for fall. You can really add any veggies you’d like to this dish, but I’ve always loved corn, peas and carrots. Along with celery, onions and garlic for some flavour, of course. I also swapped the traditional potato topping and used sweet potato instead. So go ahead – stuff your face with sweet potatoes! 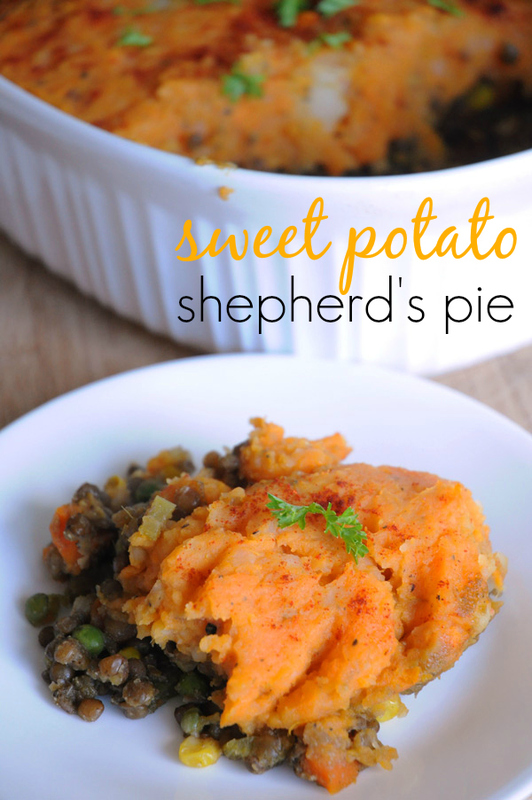 I love the hint of sweetness that the sweet potato brings to this dish. It really balances nicely with the vegetables and seasonings. I always add a sprinkle of paprika on top of my shepherd’s pie, both for flavour and because it looks pretty. And good looking food just tastes better. It’s a fact. Look it up. So let’s eat up, my friend! 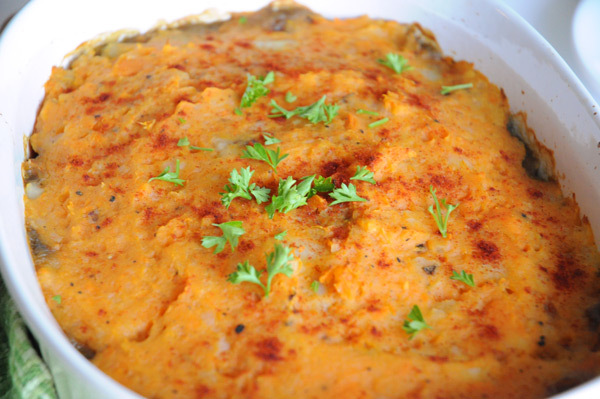 This sweet potato shepherd’s pie is not gonna last long around me – get it while you can! Steam your sweet potatoes and set aside. While the sweet potatoes are heat a large pan over medium heat. Once warmed, add a tbsp or so of oil, then add in the diced celery, onion, garlic, tomatoes and carrots. Cook for about 5 minutes, or until softened. Add the cooked lentils and soy sauce to the veggies, and heat until warmed through. Once your sweet potatoes are finished steaming, mash with the non-dairy milk some salt & pepper. 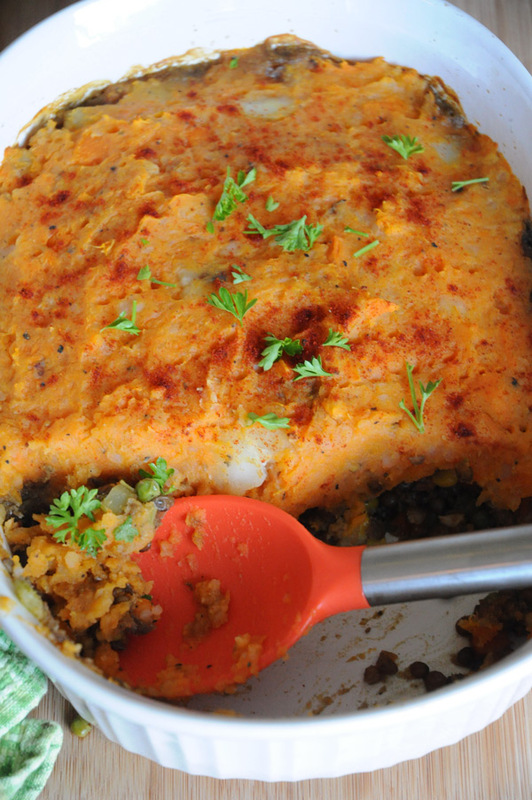 Scoop the lentil & veggie mix to the bottom of a 9x13 baking dish, then spread the mashed sweet potatoes over top and spread in an even layer. Bake for about 25 minutes, or until the top has browned lightly. Sprinkle with a bit of paprika and fresh parsley, if desired. Serve warm. It’s no secret that I’m a big fan of quinoa bowls. They’re easy, they don’t take long to make, you can prepare them in advance, they’re a simple solution to excess food in your fridge that needs to be used up, AND they travel well. If those aren’t good enough reasons for you to go make yourself a quinoa bowl RIGHTTHISSECOND, I don’t know what is. I often make pretty simple quinoa bowls because I can’t be bothered to slave away in the kitchen for hours on end (usually). So recently, I made this bad boy. And he was YUM. 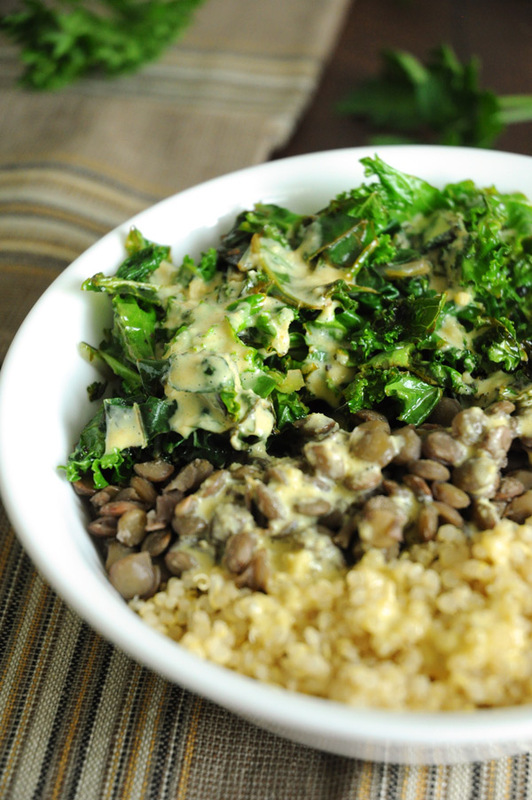 Only 3 things in my quinoa bowl (including the quinoa) and a delicious, savoury dressing smothered on top. Awww yea! It doesn’t look like much, but it was perfect. The dressing really makes this bowl, though, so if you skip it, you will have a very sad, bland, boring quinoa bowl on your hands. 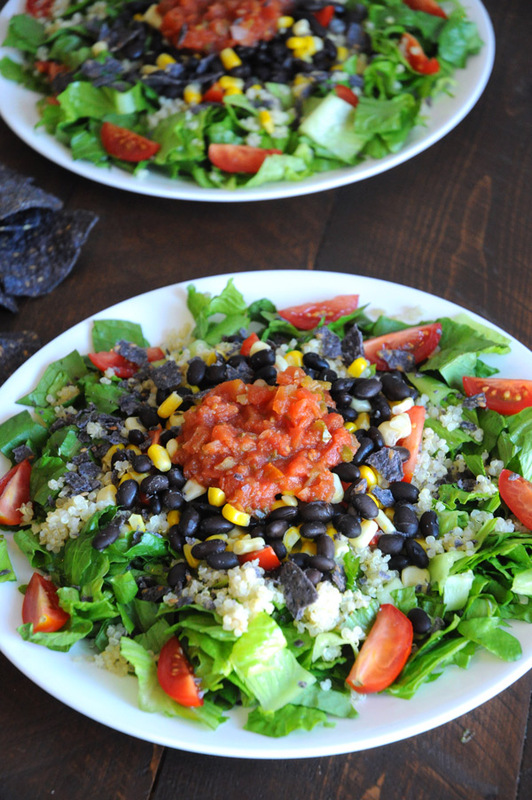 I’m still working on getting my little ones to eat quinoa bowls, but they are stubborn! They’ll eat the quinoa, but only if it’s plain. One of them will eat the lentils, but only if the other one isn’t around telling her how “gross” they are. Sigh. One of these days my kids will like more than just bread and chocolate – right? Please tell me I’m right! First, cook up some quinoa and divide between bowls. Cook up some lentils and do the same. While those two are cooking, sautee some greens with a tiny bit of oil, salt, and black pepper. Then, make the dressing. Ta-da! No muss, no fuss. Simple, easy, delicious. Add lentils, water, garlic and bay leaf to a small pot. Bring to a boil, then reduce heat to low-medium and simmer about 25-40 minutes, or until most of the liquid has been absorbed and the lentils are tender. Remove bay leaf and crushed garlic. Set aside. Add quinoa and water to a small pot. Bring to a boil, then reduce heat to low-medium and simmer about 12 minutes, or until most of the liquid has been absorbed and the quinoa is tender. Heat oil in a medium pan over medium heat. Once warmed, add the greens and cook until softened. Sprinkle on the salt and pepper, turn off the heat, and set aside. In a small bowl, whisk together all ingredients until smooth. 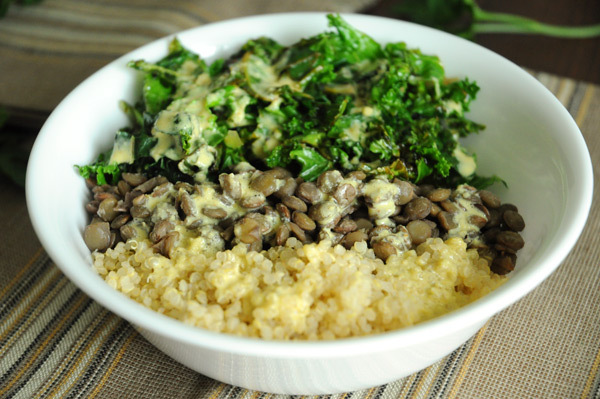 Divide quinoa between bowls, then add in the lentils and sauteed greens. 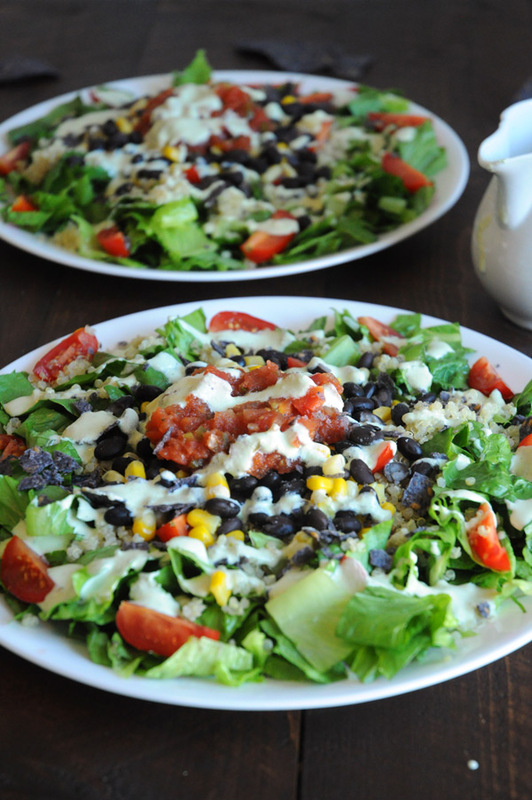 Pour a healthy amount of dressing over each bowl. Serve warm! Have you ever made a recipe that was SO GOOD that you just couldn’t wait to shout it from the rooftops and tell all of your friends? Well, I have. (Often.) And this is one of those recipes. This past weekend, I was struggling with my menu plan. Nothing on it sounded interesting to me. I needed to change it up. So I did what I always do when I can’t think of what to make: I turned to my dear friend Pinterest. She gets me. She solves all of my [food-related] problems. 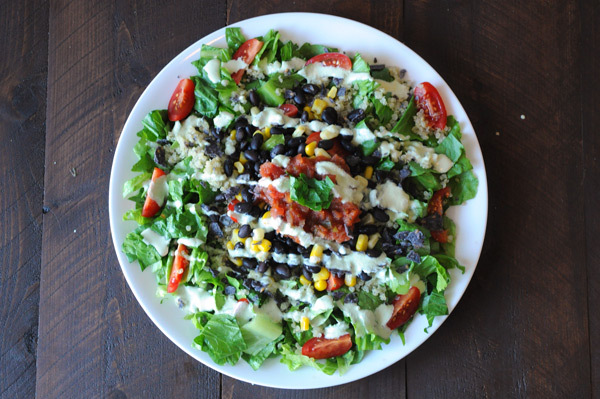 While I was browsing Pinterest, I came across this older recipe from Angela – Heat Wave Summer Salad. I wouldn’t say we were having a heat wave that day, but we certainly were experiencing a really hot summer’s day, so I checked out the recipe. And…. I’m not gonna lie, I almost went back to searching Pinterest. Wheatberries with peaches and berries? Plus chickpeas and sauteed greens? What? How does that even work?! And the dressing has mustard and CINNAMON. Everything just sounded so… weird. Like, there’s no way that combination of food would actually work. And then I remembered that it was Angela sharing the recipe, not some random person that just started a food blog 2 weeks ago. Angela is a well-respected vegan food blogger, and has been for years – there’s no way she would post a recipe that tasted weird! So, I decided to give it a go. And all I can say is – YOU HAVE TO MAKE THIS RECIPE. Holy wow is it ever good. The ingredients combine so well, and it’s like a flavour explosion in your mouth with every bite. The dressing, as weird as it sounded to me in the beginning, really helps pull everything together and make it a well-rounded, satisfying dish. This recipe makes a lot, but I don’t suggest cutting it in half, unless you’re just making the recipe for one person. Because, hello – LEFTOVERS! I had leftovers of this yummy meal for lunch yesterday and it was marvelous. Just as good as when I’d made it the day before. So don’t be weirded out by the ingredients in this dish. Just trust me (and Angela) when I say that this recipe is AMAZZZZZING. 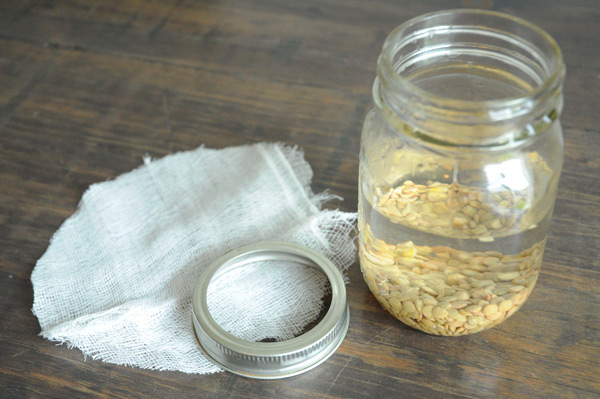 Cook your wheatberries by combining 1 cup wheatberries and 3 cups water to a large pot. Bring the mixture to a boil, then reduce heat to simmer, cover, and cook for about 1 hour. Sautee your kale in a pan of water (just a bit of water is fine), until wilted. Set aside. Chop your almonds and add to a large bowl with peaches, blueberries, strawberries, chickpeas, sauteed kale and cooked wheatberries. Add in the dressing (all of it), and mix well, being careful not to smash the fresh fruit. Serve cold or at room temperature (I think it tastes best at room temperature). Add all ingredients to a small mason jar (or small bowl) and shake/whisk until combined. Taste and adjust seasonings, if needed. Recipe slightly adapted from Oh She Glows. *For a nut-free dish, omit the almonds. Replace with sunflower seeds. *If you don't have hemp or flax oil, replace either with extra virgin olive oil. 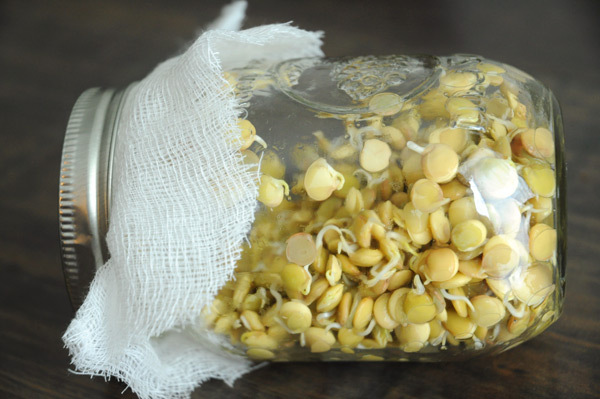 Sprouts are one of the easiest things you can make at home. I used to buy sprouted lentils all the time, because they are awesome in salad, but now I make my own because the simplicity is hard to beat. Not to mention, it’s much more inexpensive to sprout lentils at home than to buy sprouted lentils at the store! 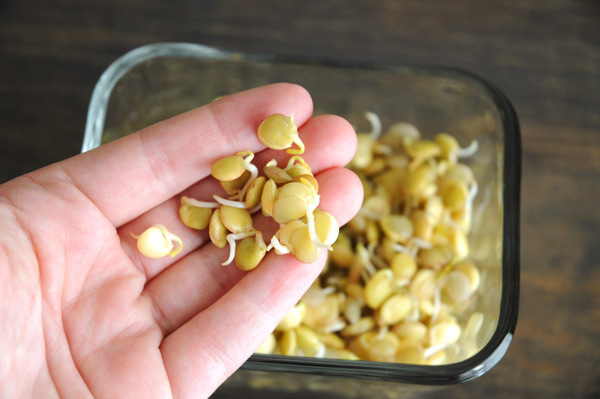 So, why do you want to eat sprouted lentils anyway? 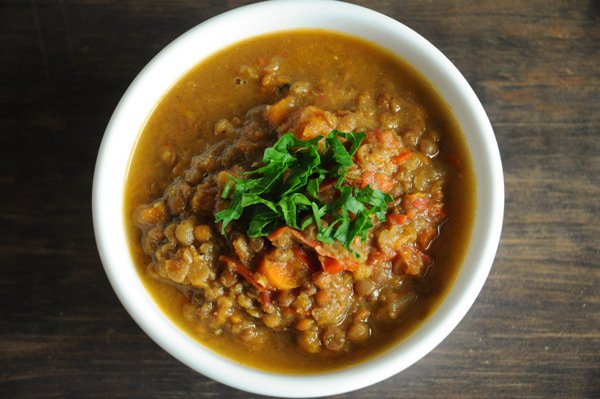 Why are they better than regular lentils? 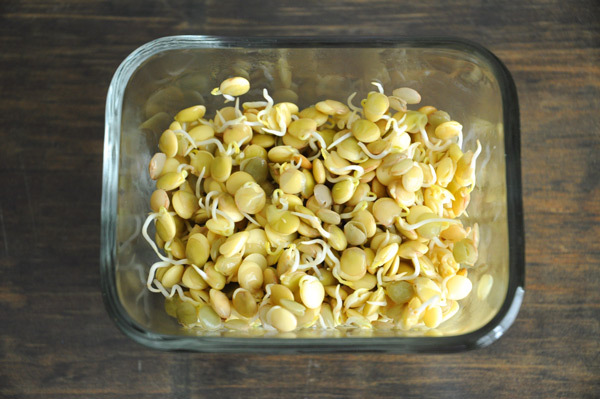 While cooked lentils are a powerhouse of nutrition, sprouted lentils are even better. They’re easier to digest, leave you with less gas & bloating, and sprouting increases the amount of vitamins in the lentils. 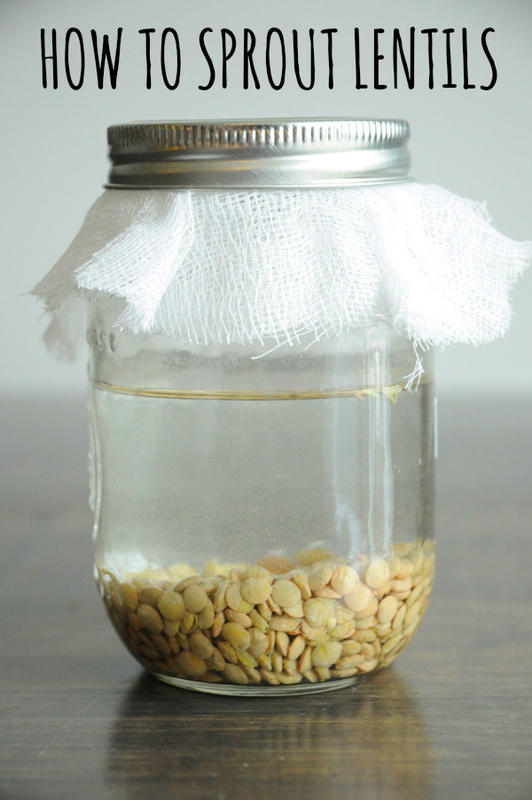 You only need 4 things to make your own sprouted lentils: a mason jar & ring, very thin cloth (I used cheesecloth), water, and dried lentils. 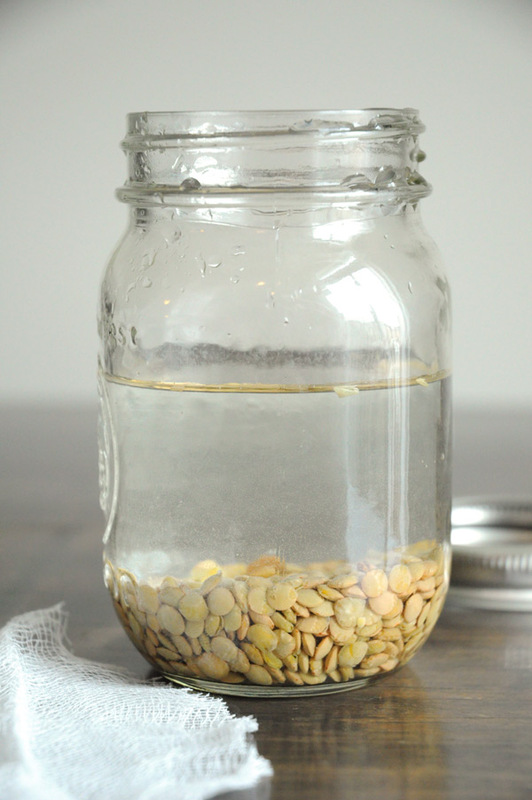 The first thing you want to do is put some lentils in a jar (I used about 1/4 cup lentils and 3/4 cup water). The lentils are going to expand quite a bit, so don’t put too many of them in there. Just a little bit will yield quite a few lentils once they’ve sprouted. Put the lid on your jar, with the piece of thin cloth underneath. Make sure it’s on there tight. Then stare at your jar of lentils. This is going to be so exciting! Homemade sprouted lentils for salads, in regular-lentil dishes and even as a tasty snack on their own! Put your jar in a dark corner of your kitchen and leave them alone for 24 hours. I put mine in the back corner of my kitchen, away from direct sunlight. 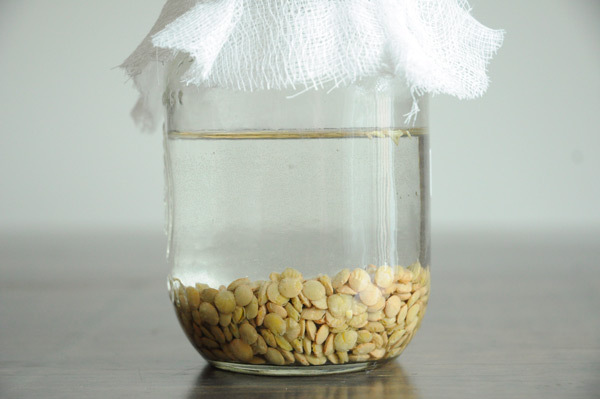 After 24 hours, drain the water, rinse the lentils and put them back in the jar. Add a new piece of thin cloth to the jar, do NOT add any more water, put the lid on the jar and let it sit in a dark corner again, for about 12 hours – only this time, lay it on it’s side. 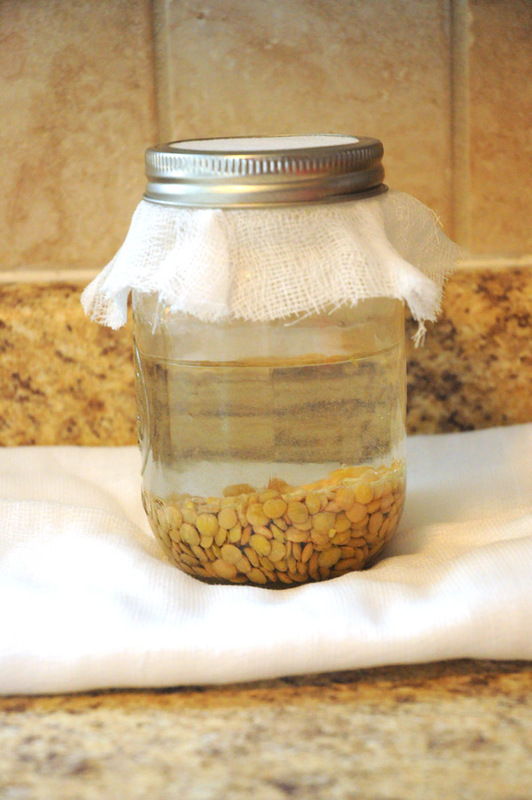 Rinse the lentils, drain them, and add a new piece of cloth, Leave them out of direct sunlight, repeat this process every 12 hours, until your lentils have sprouted and the sprouts are at least 1/4 inch in length. This took about 3 days for me. 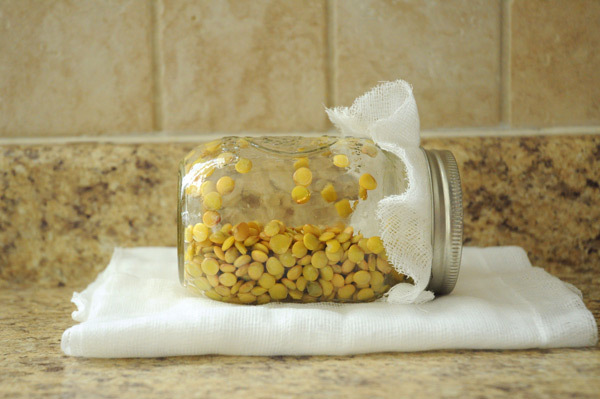 Spread the lentils out on a towel and let air dry before storing in the refrigerator (in an air-tight dish). They will last for 5-7 days. What? Lentils can be cute, can’t they?